As the largest borough by area in New York City, Queens is also the most diverse. From Long Island City, with its high-rises, waterfront location and proximity to Manhattan to more quaint, suburban neighborhoods like Middle Village, Queens has a little something for everyone. The borough has long been a popular landing place for immigrants leading to the development of a vibrant cultural, culinary and entertainment scene. As with much of NYC, recent decades have brought about a real estate boom in Queens that has led to an influx of new residents and businesses. Located in northeastern Queens, a ways away from the hustle and bustle of Manhattan, Bayside feels more suburban than much of the rest of Queens. This is mostly due to the more relaxed vibe as well as the neighborhood's many parks and abundance of single-family homes and detached houses. 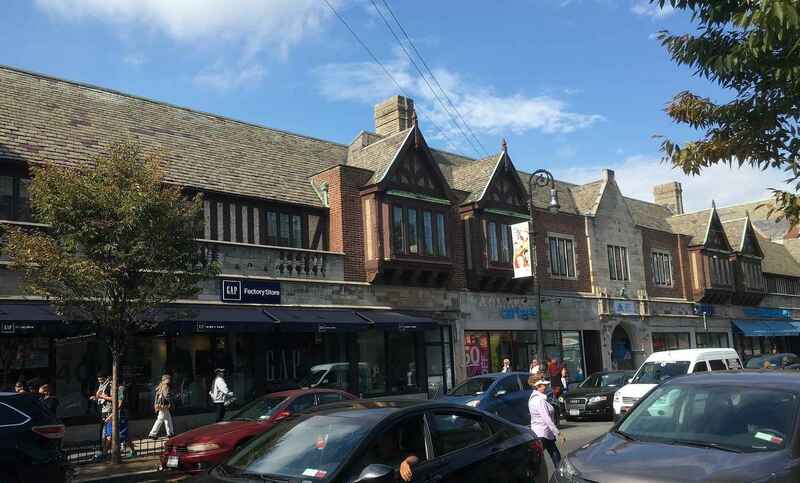 Bayside has a long history of being an affluent neighborhood and has a number of smaller bedroom communities within its borders including Bay Terrace and Bayside Gables, one of the wealthiest areas in all of Queens. 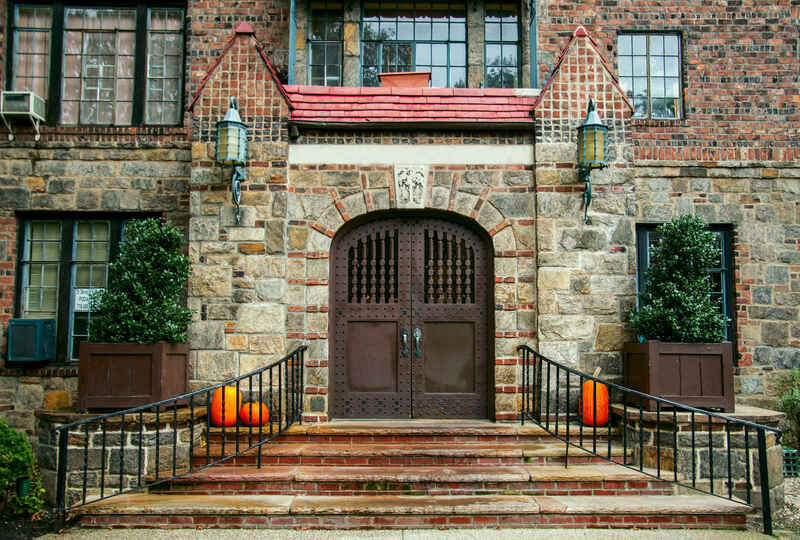 Back in the 1920s, when movies were still being made in New York City, there were several movie studios in the neighborhood, and notable actors Charlie Chaplin, Rudolph Valentino and Gloria Swanson were among the many who maintained elegant homes in Bayside. While the neighborhood may no longer be home to so many celebrities, it has nonetheless remained desirable thanks to its highly rated public schools, waterfront location, family-friendly vibe, and low crime rate. This has, in turn, kept real estate prices high. With a storied history dating back to the 1640s, Flushing is one of the oldest communities in Queens and was one of just five original towns to be part of Queens County back in the 17th century. 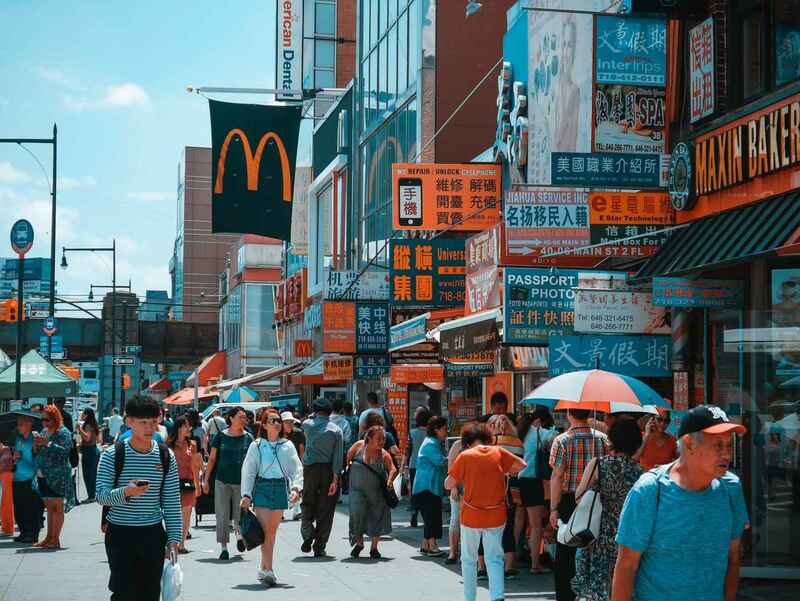 Nowadays, Flushing is known as one of New York City's melting pots and for its large Chinese and immigrant communities, with approximately two-thirds of residents in the neighborhood being foreign-born. Flushing Chinatown is one of the largest and fastest growing in the world and rivals Manhattan's Chinatown in size, importance, and cultural influence. As you might imagine this has made the neighborhood a foodies paradise, with restaurant goers making the trek to Flushing from all over the city. When it comes to real estate, prices in Flushing pale in comparison to other neighborhoods, making it popular for those looking for great value. The tradeoff, however, is a longer commute as it can take 45 minutes to an hour train ride to get into Midtown Manhattan, and even longer to make it to Downtown Brooklyn. Forest Hills in Queens is a unique neighborhood that offers residents a mix of tranquil suburban living combined with easy access to all the perks of urban New York City living. This has made Forest Hills highly desirable among families as well as anyone who prefers to come home and escape the urban jungle all while remaining just a short subway ride from the heart of the city. 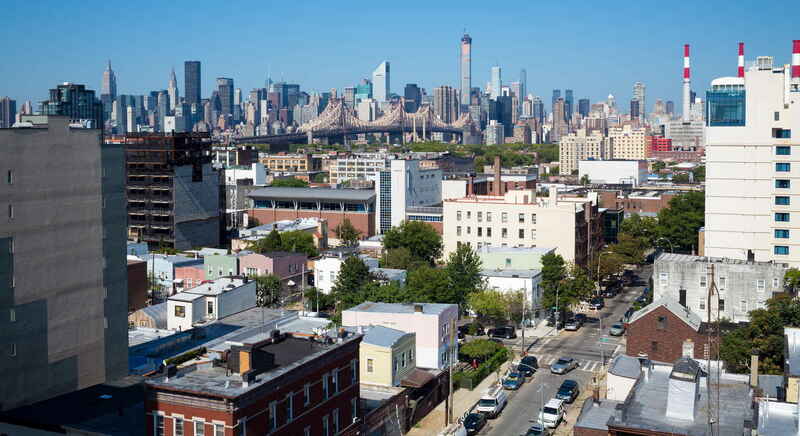 The neighborhood is consistently rated as one of the best places to live in NYC thanks to a combination of good public schools, low crime, and excellent public transportation, thanks to its location in central Queens. In recent years a number of new condos and apartment complexes have been built in the neighborhood, but overall the real estate market is mostly comprised of single-family homes and co-ops. While real estate prices in Forest Hills have been on the rise, apartments and houses in the neighborhood still remain well-priced compared to NYC’s other popular nabes. 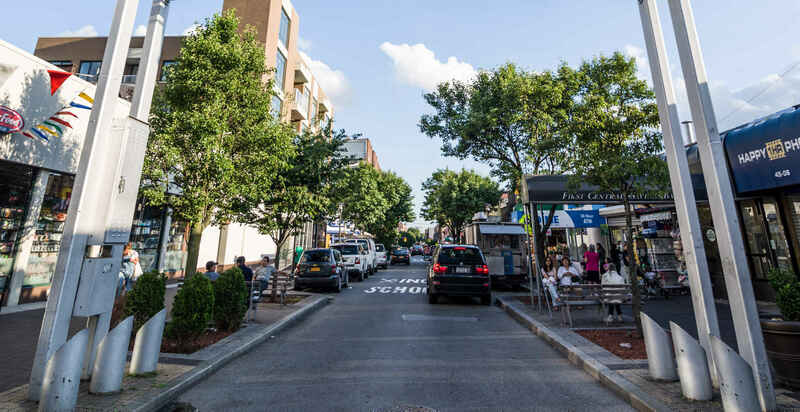 Jackson Heights is a residential neighborhood in central Queens that has seen an increase in popularity in recent years thanks to its attractive real estate prices and central location, which offers residents a quick and easy 25-minute commute to midtown Manhattan. Many of the neighborhood's newer residents have been priced out of Brooklyn (long gone are the days when those priced out of Manhattan could look to Brooklyn for affordable housing) and are interested in Jackson Heights' unique housing stock, which includes Tudor architecture and pre-war coops, many of which have private gardens. Unsurprisingly, this has driven real estate prices up in recent years, but the neighborhood still remains a great value and has maintained its welcoming vibe avoiding the large scale new development other parts of Queens and Brooklyn have experienced. Jackson Heights also appeals to those who want to live in one of NYC's most diverse neighborhoods (over 50% of residents are foreign-born and there are over 150 languages spoken in the neighborhood). This, of course, means the area has a vibrant food scene, with some of the best ethnic restaurants in the entire city. Nightlife, however, is more subdued, making Jackson Heights ideal for families. Located on the westernmost end of Queens, just across from Midtown Manhattan and Roosevelt Island, Long Island City (often shortened to LIC) has long been considered to be one of New York City’s most exciting up-and-coming neighborhoods. Those days are over as we can confidently say that Long Island City has already arrived, and can now be considered to be amongst NYC’s most desirable residential neighborhoods. Long Island City provides residents easy access to Manhattan and a convenient commute while also offering a great cultural and entertainment scene. A fantastic array of locally owned boutiques, art galleries, and shops as well as many hip bars, lounges and restaurants can be found throughout LIC. The neighborhood’s incredible riverfront location combined with stunning views of the midtown skyline, and attractive real estate prices at its many luxurious, new development apartment buildings and condos are what helped Long Island City boom, but nowadays the neighborhood’s hip, artistic vibe is just as responsible for charming residents and visitors alike. If you’re looking for some “real good” living and real estate you might as well head to Rego Park, Queens, a neighborhood that got its moniker from the Real Good Construction Company, which built many houses in the area back in the 1920s and 1930s. Nowadays, this centrally located neighborhood is best described as up-and-coming with many new commercial and residential developments being built including a number of luxury apartment and condo buildings. Rego Park is an ethnically diverse neighborhood, home to large Latin American, Jewish, Eastern European, and Asian communities. 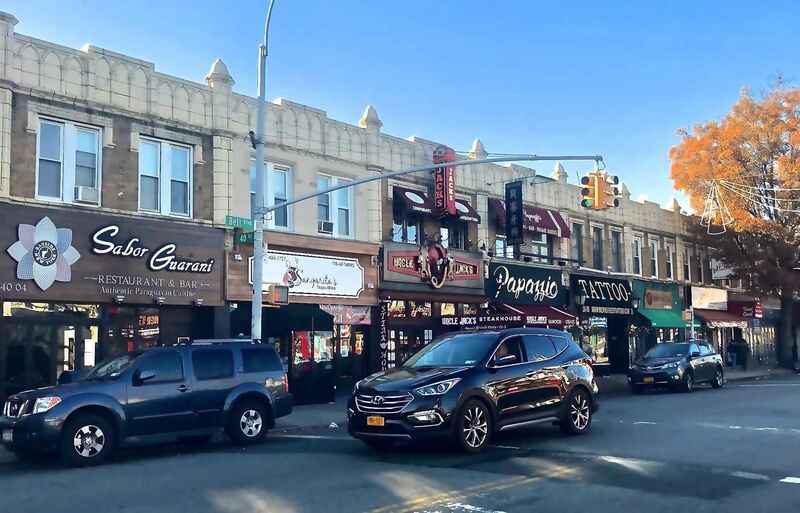 Parts of the neighborhood maintain a quaint, small-town vibe, but overall Rego Park offers its residents some of the best dining and shopping in Queens. If you're looking for nightlife and entertainment, you'll likely be disappointed, but the rest of the city is never far away thanks to Rego Park’s central location and excellent transportation. The neighborhood is served by multiple subway lines and is only a half an hour ride from Manhattan. Sunnyside, Queens, is a primarily residential neighborhood located in western Queens, only a short subway ride, on the seven train, from Midtown Manhattan. Although it is close to the epicenter of New York City, Sunnyside maintains a far more laid-back, suburban vibe, which has made it a popular neighborhood with families. In Sunnyside, friendly neighbors spend more time getting to know one another compared to other parts of the city creating a tight-knit community. With such a welcoming atmosphere it's no surprise that Sunnyside has a burgeoning and culturally diverse food & bar scene. Another major perk of living in the neighborhood is that apartment rental prices in Sunnyside are typically much lower than in neighboring Long Island City and Astoria. One thing that Sunnyside lacks, however, is nightlife, but thanks to its central location you're only a short 25-minute subway ride from Midtown Manhattan.